A little spice, some sweet fruit, and a touch of tequila: that is what you'll find in The Late Night Lychee. Think of this drink recipe as an enhanced Margarita that's served by the pitcher. It's perfect for a patio party and is sure to intrigue anyone's taste buds. Inside The Late Night Lychee, you'll find a nice silver tequila flavored with the sweetness of a lychee-flavored syrup. A great contrast comes from adding a hefty amount of fresh cilantro and a few slices of jalapeno pepper. This pitcher-sized cocktail has a great kick, but it's not too spicy. You'll have enough for about eight 3 1/2-ounce drinks. Invite a few friends over and surprise them with a unique cocktail or two. Combine all of the ingredients into an ice-filled pitcher. Pour over ice into salt-rimmed margarita glasses. Garnish each with lychee and cilantro. A lychee is a small tropical fruit that tastes like a cross between strawberries and watermelon. They're quite delicious and a fantastic way to make an exotic cocktail. When it comes to the syrup, you have the choice to buy or DIY. Syrup brands like Monin and Torani make a nice lychee syrup. If you can't find them at your local stores, they are available online. The other option is to make your own lychee syrup and it's just as easy as any other simple syrup. You simply need the white, fleshy fruits. You can often find these canned at Asian markets or sections in the grocery store, though sometimes you can even find whole, fresh lychee. You will have to remove the stone and there are a few tricks that will help you out with that. It can be easy to add too much spice to drinks that include hot peppers. Even if you enjoy all things hot and spicy, it's best to proceed with caution when adding jalapenos to this margarita. After all, you want to be able to taste the drink and that's not possible if you burn your tongue. Stick with the recommended number of pepper slices. The longer they sit in the pitcher, the more pepper flavor will be infused into the drink. To reduce the heat, remove as much of the white membrane as possible because this is where most of the pepper's capsaicin lies. Also, be sure to remove the seeds as they can be quite annoying in a cocktail. They hold no spice and do little in the flavor department. 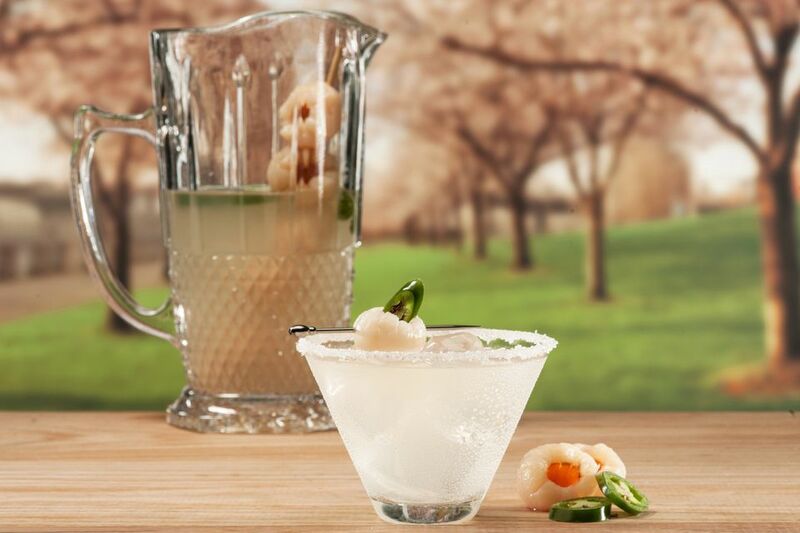 With careful attention to how you prep the pepper, The Late Night Lychee can be a well-balanced drink. Remember to wash your hands after handling jalapenos. Few things ruin a party faster than a little pepper burn. Want to Make a Single Drink? Transforming this recipe from a pitcher into a single serving could not be easier. Simply replace the word "cups" with "ounces" for the liquid ingredients and you'll have a nice 3- to 4-ounce drink when the ice is factored in. Reduce the peppers to just one or two slices and the cilantro to one or two sprigs as well. How Strong Is The Late Night Lychee? This cocktail gets a considerable amount of dilution by the time you drink it. Not only does ice get stirred into the drink, but it's also used in each glass. That helps tame and marry the flavors and brings the alcohol content down a bit. Though it will vary, we can estimate that this drink weighs in somewhere around 18 percent ABV (36 proof). It's in line with other margaritas and is poured short, so your guests shouldn't get drunk off one pitcher.